I finished my first triathlon - a teeny, tiny sprint triathlon - a few weeks ago, so, ok, a triathlete could look like me. But then there's Johnny Agar, an intense 22-year-old junior at Aquinas College in Grand Rapids, Michigan, majoring in sports management and business. Johnny's completed six marathons and finished an Ironman 70.3 last year. His heroes include Justin Verlander and Miguel Cabrera of the Detroit Tigers. Someday, he plans to join Major League Baseball in the front office. "Being an athlete is not easy," Johnny told me at the beginning of our telephone conversation. Tell me about it, I thought to myself, but I had no idea. He said his weaknesses are chocolate and donuts, and ice cream is a huge motivator. He's a country music fan and listens to Darius Rucker, Florida Georgia Line, Blake Shelton, Maddie and Tae, and Zac Brown Band when he trains, which he does every day. I'm enormously inspired by people who compete in Ironman events because I know personally what it means to dig deep. I spoke with him a month after he learned he was selected to compete in the Ironman World Championship Triathlon in Kona, Hawaii, on October 8, 2016. An Ironman 70.3 comprises a 1.2-mile swim, a 56-mile bike, and a 13.1-mile run. Ironman Kona is a 2.4-mile swim, a 112-mile bike, and a 26.2-mile run. Johnny was born premature and has lived his entire life with cerebral palsy, which affects the part of the brain that controls your muscles ranging from voluntary movements to reflexes. In Johnny's case, the disorder does not affect his speech, which may be why his least favorite event in a triathlon is the swim. That's the only time when he is unable to have a conversation. He said walking a mile for him is like running a marathon for most people. He's had numerous surgeries on his legs to lengthen his muscles and on his eyes, and a shunt drains fluid from his brain. For Johnny, Ironman Kona will be a 2-hour swim, an 8- to 9-hour bike, and a 5- to 6-hour marathon run. Johnny's among five athletes competing in Ironman's exhibition division for physically challenged athletes. His partner, and his coach, is his father, Jeff Agar, 53, who runs an office furniture manufacturing company in Grand Rapids as part of Leggatt & Platt, Inc. Competing as Team Agar, Jeff will pull Johnny in a boat during the swim and in a chariot during the bike. For 25.2 miles of the run, Jeff will push his son until the last mile, when Johnny will stand up out of his chair and use a walker to make his way to the finish line, all in 17 hours. While Jeff played competitive sports in high school and college and had an early career as a pitcher with the Detroit Tigers, he said he never considered himself an endurance athlete. "You had to run because it was part of the sport," Jeff said. "Long distance running was low on my list of things I wanted to do." He got the idea to compete as a team with Johnny when he and his wife, Becki, realized their son had the passion and commitment of an athlete who was driven to compete. Johnny got involved with MyTeam Triumph where able-bodied athletes take kids with special needs with them through a road race or a triathlon. The kids are the captains of the team, which can include two or three "angels" pushing and pulling the team across the finish line. "Johnny LOVED it," Jeff said. "Then I thought, I'll do a 5k with him." When a 70-year-old power walker nearly beat them during their first race, Team Agar decided they needed to train. Both Jeff and Johnny started working out and joined Run GR, a running group in Grand Rapids. They alternate speed workouts with long-distance runs and incorporate biking and swimming as well. "You have to have some motivation, whether it's losing weight or to improve your health, or some reason to be doing these crazy activities," Jeff said. "Some people just love it, but for most of us, it doesn't always seem natural." They started doing smaller distances and then going increasingly longer. After they were selected to compete in Ironman Kona, they began working with Grand Rapids triathlete and triathlon coach Kattie Carpenter. While Jeff trains before work from 5 - 7 am and after work from 6:30 to 8:30 pm and on weekends, Johnny does all of his intensive therapy and training during the week at the Conductive Learning Center in Grand Rapids. The center, which goes beyond physical therapy, is a major reason Johnny is able to walk at all, Jeff said. "When Johnny first decided he wanted to walk a mile in a race he had only walked 20 steps in his life," Jeff said. The specialists at the Conductive Learning Center have had an enormous impact on Johnny's strength and flexibility, he added. For the average person, there are 2,000 steps in a mile. Dealing with the heat and walking after 16 hours of the race will be Johnny's toughest challenge yet, Jeff said. Team Agar is also supported by Becki, who ran track in high school and serves as Johnny's chef and mental coach (his words), as well as his sisters Annie, a softball player who has a black belt in karate, and Grace, a gifted dancer. Nutrition is a huge factor for Johnny, and he's trying a number of strategies over these next few months. While Jeff, who weighs 200 lbs., may need to consume more calories to strengthen and grow his muscles to sustain him through the 17-hour event, Johnny said he needs to stay lean, possibly under 130 lbs., to make it easier for Jeff to push and pull him. He isn't able to eat much during a race and even then he keeps foods bland so that he doesn't get an upset stomach. He'll splurge and have cookie dough ice cream but only occasionally. "Having a positive attitude is the biggest thing for me," Johnny said. "My disability is really not a barrier. It's more of a mental thing." When he watches the Detroit Tigers, the baseball team inspires Johnny to reach his own goals, he said. He was 11 when he first decided he wanted to walk. "It was incredibly difficult and took a huge amount of work." Working hard is a hallmark of Team Agar. By now Jeff considers himself a long-distance runner, "by definition and not necessarily by ability," he said. "That's the thing about having a special needs child," Jeff said. "We would have never dreamed a lot of things we'd be able to do. Johnny's gotten us into things that are good for us." Jeff: Start out with a group similar to myTeamTriumph. Experienced runners and triathletes are a huge help as you learn everything you need to know about competing in these kinds of events. Johnny: Never settle for letting any challenge get in your way. It is up to you to find a way to overcome those challenges and to make a difference in your own life. 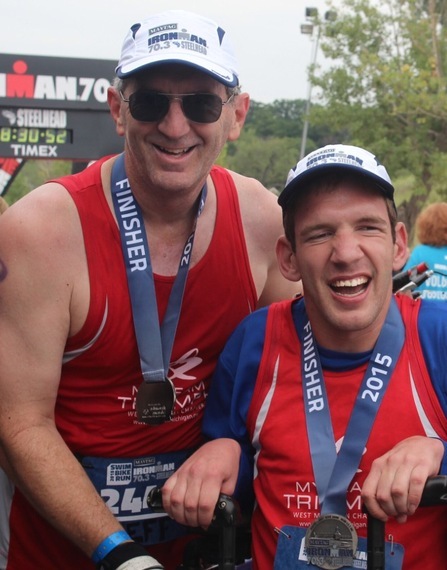 See Team Agar for additional information about Johnny and Jeff's journey to Ironman Kona.